Watson Company is a Cambridge, Minnesota family owned business founded in 1957 by Bob Watson. First of course, like everyone in the Greatest Generation, he served his country. Bob was in the Army from 1940 until 1946, and was a 1st Sgt with Patton�s XII Corp. After the war in 1946, Bob began working for Associated Distributors operating a cash wagon. He would stop at the customer�s location, get the order, go back to the truck, put the order up and deliver it. In 1957 Bob bought his truck and the inventory. He had $105.00 to work with. The company�s area of distribution in 1957 was roughly a 30-mile radius around Cambridge. Bob�s warehouse was his one car garage at his home. Products were candy, tobacco & snacks. With a lot of hard work on Bob�s part the business grew and another truck was added. Bob�s nephew George Nold handled the second route for several years. In 1967 Bob�s son, Steve Watson, joined the company taking over the truck and routes that George had been running. In 1963, a small warehouse was constructed just east of Cambridge. Over the years this warehouse was added onto twice. 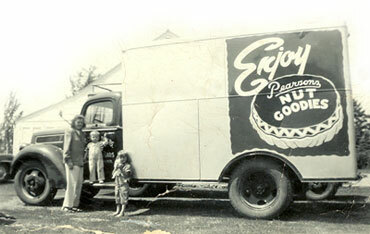 During the 70�s the company switched from cash trucks to pre-selling with next day delivery. At this time the company had 4 employees. Later, with the growth of the business, a larger warehouse was built on highway 65 on the south end of Cambridge. The business resides in this building to this day. In 1980 Bob retired and passed the business on to his son Steve. Bob and his wife spent many enjoyable winters in Arizona before his passing in 2004. Today the company carries products in 15 major categories including grocery, dairy, institutional foods, concession supplies, frozen and equipment. The company delivers all orders with its own fleet of modern multi-temperature trucks. Steve, along with a staff of very efficient employees, some of which have been with the company for over 30 years, continue to run the company with the same hard working attitude his father started it with. The Watson Company is dedicated to working closely with its customers to provide quality products and services at an excellent value. Customer service is number one. We always remember we can be no more successful than our customers.